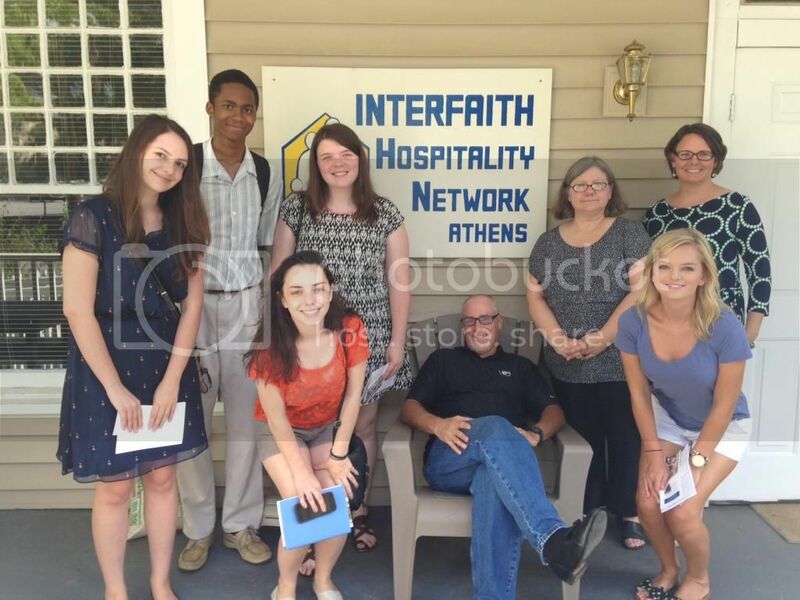 Last week, our summer fellows got the opportunity to sit down with Interfaith Hospitality Network (IHN) to talk about their work in the Athens community.Executive Director, Ken Sherman was kind enough to take some time out of his day to explain how IHN of Athens strives to address the crisis of homelessness that many families face in the Athens area. IHN is the result of one New Jersey woman’s compassion and activism.Karen Olson commuted from New Jersey to New York every morning for work.During her commute she would routinely pass by the old Port Authority building where many of New York’s homeless set up shelter.Karen began bringing sandwiches and occasionally money for the homeless on her commute.One Thanksgiving, she visited the old Port Authority building and brought the homeless to her congregation to feed them.What started out as a gesture of kindness by one woman, ended up spreading into a nationwide effort to house and feed families with children struggling with homelessness.Interfaith Hospitality Network now has more than 180 branches in 41 states dedicated to helping families get back on their feet by not only housing them but providing the resources and opportunities to find steady jobs and affordable housing. Part of the reason IHN Athens has been able to serve nearly 500 guests over the past 10 years, with about 75-80% of those going on to live successfully and independently, is because of the specialized focus of their program.As the Athens service director and case manager, Regina Roth-Goldman is the first point of contact for potential guests of IHN Athens, and she was kind enough to explain the screening process.IHN only deals with families with children under the age of 18.Due to the nature of their program they are not equipped to handle families with individuals with a history of felonies, domestic abuse or mental health problems.Regina refers those individuals or families to the appropriate Athens program more capable of handling such situations.The typical family IHN receives will likely have been recently evicted, going through a bout of financial trouble, and/or jobless.While IHN’s limitations decrease the number of families they can serve, their model allows them to keep entire families together regardless of gender or age and provides counseling that serves them in a productive way. Guests of IHN typically stay for 60-90 days and are required to adhere to the schedule that IHN has set out.Assistant director Kendall Weinberg walked us through a typical week at IHN for a family.While IHN depends on more than a dozen Athens churches to house their families, they are not religiously affiliated.Families will begin their stay on a Sunday afternoon, arriving at a Church that has a private space set up for them.During the week, children are transported to school or daycare in vans operated by volunteers.Adults will be taken to IHN headquarters to utilize job search or counseling services where they may have a job interview or an appointment with the department of labor.Around 5pm, children and adults are picked up from their respective daytime activities or jobs and are transported back to their church for dinner cooked by volunteers and socialization with the volunteer staff.IHN stresses the goal of their program as a solution not an endgame for homeless Athens families.Their services can only be rendered once per family and families cannot return to the same IHN home after their 60-90 day stay. Although IHN Athens has enjoyed great success in placing families in steady jobs and affordable housing since they opened their doors in 2004, Sherman expressed that there is room for improvement.IHN Athens is currently waiting for a grant that will extend their network and allocate more resources for follow-up support and counseling.There are also great challenges for IHN in finding affordable housing and reliable childcare.Both of these are macroeconomic issues that affect not only the Athens area, but also communities large and small nationwide. IHN describes itself as “a community response to the issue of homelessness”.As such they rely on the generosity of volunteers and donations.If you would like to keep up with what they’re doing you can visit their Facebook page or find out how you can help at their website.